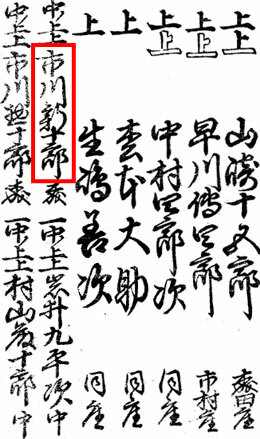 A minor Edo tachiyaku actor held the name of Ichikawa Shinjûrô between 1718 and 1723, most likely a discipke of Ichikawa Danjûrô II, but he was never acknowledged as an official holder of the name. Born in Kamigata. He started his career around 1820 as a disciple of Asao Yûjirô I, who gave him the name of Asao Yaozô. 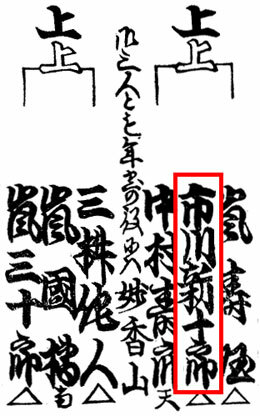 He took the name of Jitsukawa Yaozô in the 1st lunar month of 1833 in Ôsaka when his master became Jitsukawa Gakujûrô I. His master died the 4th day of the 11th lunar month of 1835 and he joined a few years later in 1839 the Ichikawa clan, most likely as a disciple of Ichikawa Sukejurô, taking the name of Ichikawa Shinjûrô I in the 11th lunar month of 1839 at the Kado no Shibai. this minor tachiyaku actor was active in Kamigata up to his death 20 years later, in 1859. Born in Ôsaka. He started his career at unknown times as a disciple of Jitsukawa Gakujûrô II, who gave him the name of Jitsukawa Enji. He took the name of Ichikawa Fukuen II in 1866 and performed around that time mostly in miyaji shibai. He settled in Tôkyô in 1875 and became a disciple of Ichikawa Danjûrô IX. He took the name of Ichikawa Shinjûrô II in November 1875 at the Nakamuraza, performing in the drama "Tama Kushige Hakone no Adauchi". He was active in Tôkyô up to 1882. He went on tour during the summer of 1880 and died the 18th of June 1882 in the Echigo province. Born in 1866 in Edo in Asakusa. Disciple of Ichikawa Danjûrô IX, he made his debut on stage (hatsubutai) in July 1874, at the Kawarasakiza, where he received the name of Ichikawa Fukunosuke I and his master celebrated his shûmei. He took the name of Ichikawa Danshichi III in June 1888 at the Shintomiza. He became nadai and celebrated the event in April 1899 at the Kabukiza, where he took the name of Ichikawa Shinjûrô III and performed in "Mikasayama Goten" and "Kanjinchô". In his latter years, he was also a teacher in an actor school in Tôkyô. He died the 1st of July 1929. The actor Ichikawa Shinjûrô IV is the current holder of the name since May 2008.